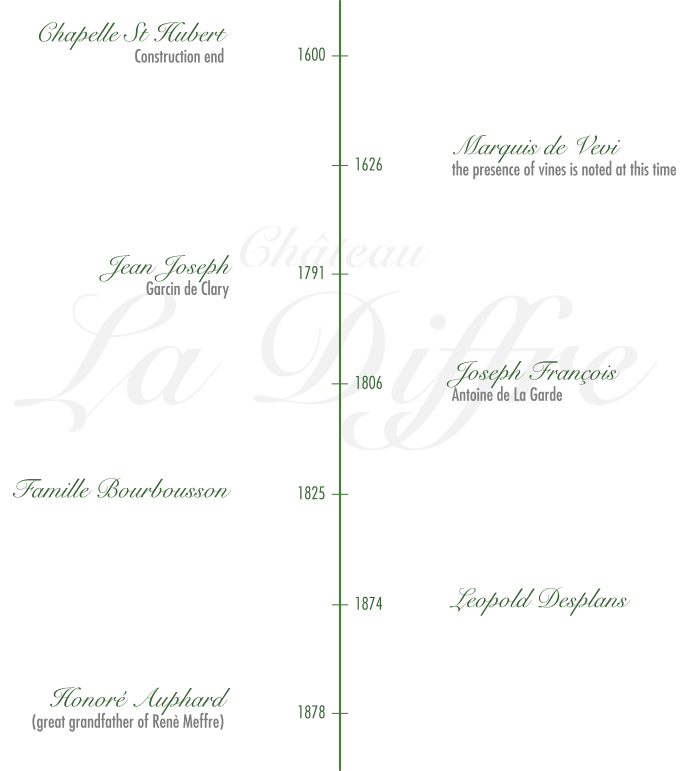 The long tradition of Château La Diffre begins in the early XVII century. After building a hunting lodge with its own chapel, in 1626 Jean Charles Audiffrey cedes all land and buildings tenements to the Marquis de Veri freshly exiled from Florence. By this deed we can attest to the presence of the first plots planted with vines on the property. Over the centuries the illustrious noble families succeed, the acquisition of substantially all assets of Leopold Desplans on the commune of Séguret by Honoré Auphand in 1878 brought the Château La Diffre in our Family. After periods troubled by family tragedies, just after World War II, Regis Meffre help of his son René and André began the transformation of the vineyard. It is through various parcels of purchases including the Plan of God and Rasteau, and the evolution of culture fashion to modern agriculture as the Château La Diffre finally found acclaim. In 2014, Rene turned to his godson Michel for support and instill a renewed exploitation. On the whole property, Grenache, Syrah and Mourvèdre are the three predominant varieties which are added Viognier, Roussanne and the Marsanne for the development of round white wines and fruity. In each appellation of our property we like our ancestors selected the best soils so that our customers find the typical characteristics of each wine. We hope the bottles left our winery is the expression of the alchemy between soil and vine grower. We strive every day to produce traditionally-class wines. We take the greatest care with grape itself to the season to start the vinification with healthy fruit wines guarantee of exceptional quality. The historical part of the Château La Diffre we are invested with the mission to carry a line of wines initiated by our illustrious predecessors such as the Marquis de Veri more recently Francois Joseph Antoine De La Garde.